MCGS VALIANT, the second Fast Patrol Vessel (FPV) designed and constructed by GSL for Mauritius Coast Guard (MCG) embarked on its maiden voyage to Mauritius on 24th May, 2017 at GSL. The delivery of the vessel added another feather in cap of GSL as Defence vessel Exporter from the country. The ship was ceremonially seen off by RAdm. Shekhar Mital, NM (Retd), CMD, Goa Shipyard Ltd who facilitated ASP Outam Kumar Guness, CO, CGS Valiant and the entire crew members on the occasion, Cmde. B.B. Nagpal, Director (CPP&BD), Mr. Sudhakar T. N. Director (Finance) besides other dignitaries were present on the occasion. RAdm Shekhar Mital said, “Contract of the vessel was signed on 17 May 2014 and the keel of this vessel was laid on 22th May 2015. The vessel was launched on 2nd Feb 2017 by Mrs K. Napaul, the Consul and Head of Consulate of Mauritius at Mumbai. 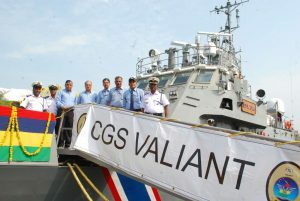 GSL has successfully delivered this ship to MCG on 30th April 2017, Four Months ahead of contractual schedule.” CMD thanked Government of Mauritius, Ministry of Defence, State Government and local authorities for providing all the necessary assistance, which has enabled GSL to achieve new milestones in the performance. ASP Outam Kumar Guness, CO, CGS Victory, while addressing the gathering lauded the excellent work undertaken in the shipyard and complemented GSL for delivery of the state-of-the-art ship for Mauritius force. He further complimented the GSL work force on their skills and proactive attitude, which is an example for others to emulate. The vessel is primarily designed for Coastal Patrolling, Anti-piracy, Anti-smuggling, Anti-drug Surveillance, Anti-poaching Operations, and Search and Rescue Operations. The vessel is fitted with 30 mm CRN-91 Gun, 12.7 mm HMGs & 7.62 mm MMGs besides state-of-the-art Navigation and Communication equipment and is capable of achieving a high speed of 37 knots. During the trials the vessel achieved 37.5 knots and all other design parameters. GSL is largest exporter of ships from Indian subcontinent and is presently executing export orders worth Rs. 1200 Cr. GSL prides itself in timely delivery of ships at ‘fixed cost’ and enjoys very strong execution skills.